I recently had the privilege of taking part in the annual Global Game Jam; It was the first year San Francisco has ever hosted a location for the worldwide event, thanks to the organizational efforts of Jane McGonigal’s new gaming startup, Social Chocolate. The theme for this year was “Extinction,” a topic not normally known for its romantic undertones. And yet in just 48 hours, fellow SF Jammers Chelsea Howe and Mike Molinari conceived, designed, and COMPLETED a game that tells a concise story of connection and intimacy: It’s called THE END OF US, and it’s pretty darn brilliant, and quite relevant to what we all intend on discussing here. 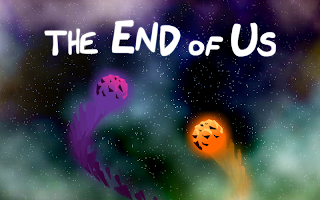 From the dual meaning of its title, to the lovable, at-times-frustrating, and downright playful AI, The End of Us is as romantic a game as one could make, and is all the more astounding for having been made in less than 2 days (Molinari cites the total productive work time as 31.5 hours). Not to say that the quality of this game is in any way surprising. Chelsea was formerly a game designer on Zynga’s massively successful Farmville, and is now Director of Design at Social Chocolate. And Mike (aka: “Bean”), is well-known in the indie games community, having developed games like But That Was [Yesterday] and [Together]. Both developers (co-designers on The End of Us), understand not just games, but the connections between people as well. It’s no accident that they came away with such a pitch-perfect Romantic game. After all, what are the required components of a good Romance story? We need our characters. We need to understand what brings them together. We need to watch their relationship go through its hurdles — both the highs and the lows. We need to witness the outside forces that threaten to tear them apart, and we always need that one last and final guarantee: the grandiose action that solidifies and confirms what their relationship means, to us as players/viewers/readers, and perhaps to the characters as well. Anyone interested in exploring romance in video games (and that’s presumably anyone writing or reading this blog), should play this game. And take notes. >wow! i just played it — the mechanic syncing up with another character is one i really admired in Mike's But That Was [Yesterday] — the scene on the swing, where you try to match your swing to the girl's. It's like dancing, and it's what love often feels like — the gentle push-pull of matching someone else's motion while also asserting your own. good find.